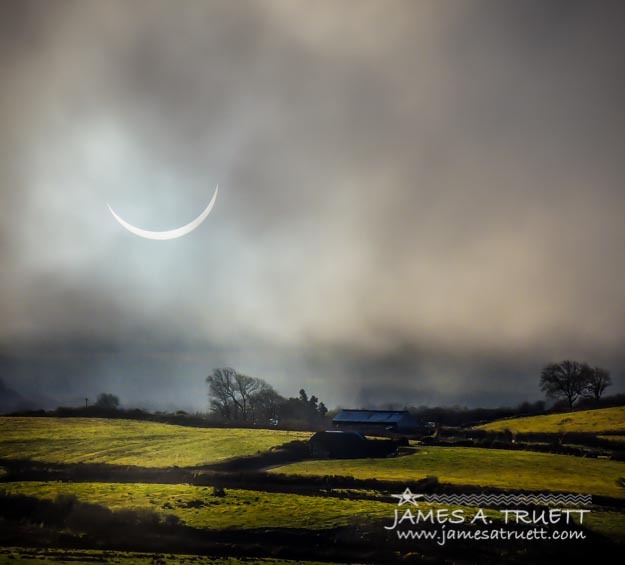 Solar Eclipse over County Clare Countryside near Lissycasey. The near-total solar eclipse of 2015’s Spring Equinox casts an eerie glow on this farm in the countryside of Ireland’s County Clare between Lissycasey and Ballynacally. The morning’s mercurial Irish weather had threatened to totally obscure this eclipse, with dark clouds and a gentle morning mist, but at last, the clouds parted just enough to allow me to capture the the moon’s shadow over the sun high over head in one image and the spooky muted glow of the countryside in another, merged together to create this composite photograph. The last partial solar eclipse was seen in Ireland 16 years ago, in 1999, and the next total eclipse won’t occur for another 75 years in September 2090, though a partial eclipse will be visible in Irish skies again in 11 years — 2026. Imagine, though, if you were living in Ireland’s Burren Region 3,000 years ago, when the Poulnabrone Dolmen passage tomb was built. You might have fallen on your knees, believing it was the end of the world! In addition to the unusual darkness, temperatures often drop substantially during an eclipse as the sun’s rays are partially blocked for up to two hours. The 1999 eclipse in Ireland was accompanied by a temperature drop of 10 degrees Celsius (50 degrees Fahrenheit)!